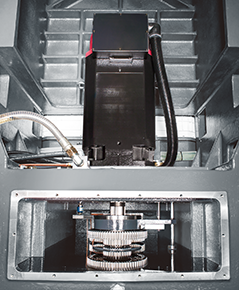 The square ram on the tooling spindle is adopted with a closed-type design and fixed with powerful wedges. 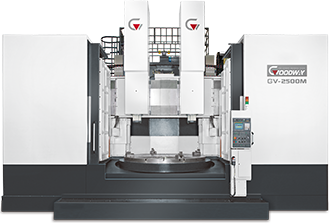 This gives the SUPER GV series with greater structural rigidity and machining accuracy compared to peer models with a semi-closed type square ram structure. 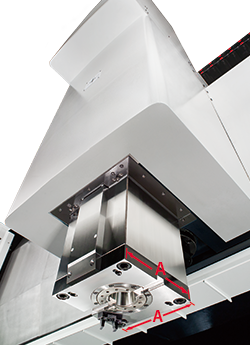 With the optional dual ram structure, multiple machining applications ( such as rough turning / fine turning or drilling / tapping / milling ) can be operated at the same time; one machine can replace two vertical turning centers which saves tool change time and increases floor space usage. The work piece spindle uses high power 2-speed gear box motor which provides 74,140 Nm torque output under low speed ( GVH-2500 ); various large sized work pieces can be overcome easily. The high reduction ratio 2-speed gear box uses high hardness Nickel-Chromium-Molybdenum alloy with forced oil-feed for lubrication and coolant; the gear box can maintain optimal performance with long life span. The high rigidity high precision cross roller bearings can sustain high radial, axial and torque load, which greatly reduces deformation and thermal errors while increasing the rotary table's rotational accuracy and load capacity when working on heavy work-pieces. The high rigidity hydrostatic bearings provide absolute zero static friction coefficient and low kinetic friction coefficient which can easily drive the rotary table without needing high torque output. Plus the stick-slip effect is eliminated under low speed which provides stable and smooth rotating movement while maintaining maximum dynamic accuracy. The hydrostatic bearings provides great damping in vertical movement and low damping in horizontal movement. The oil film damper provides outstanding dynamic rigidity.